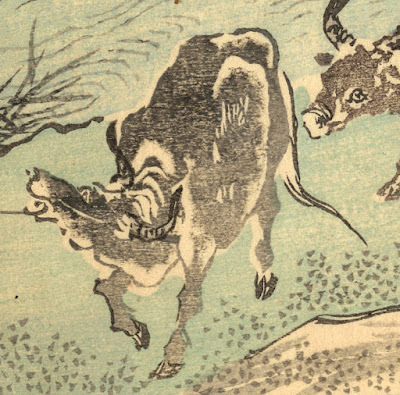 “Buffaloes in a stream with six figures” (descriptive title only), c.1851, from the series, “Kyosai Rakuga”, published by Takeda Den'emon and Marita Tetsugoro. Original colour woodblock print on fine washi paper with the signature and seal of the artist (upper left), (sheet) 21.7 x 29.2 cm. Condition: delicate impression with slight wear to the plate. The sheet is in good condition (i.e. there are no stains, worm holes or foxing), but the centre fold has been reinforced with a strip of paper (verso) and the left edge (verso) is also supported with strips of paper. 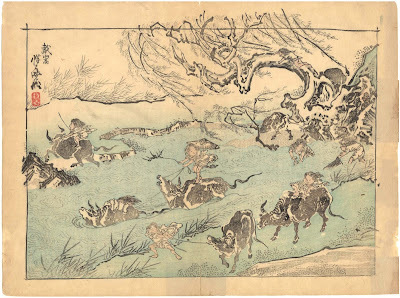 I am selling this rare original woodcut by what Timothy Clark (1993) in “Demon of Painting: The Art of Kawanabe Kyōsai” describes as “an individualist and an independent, perhaps the last virtuoso in traditional Japanese painting” (p. 15) for AU$134 (currently US$96.26/EUR86.09/GBP66.01 at the time of posting this print) including postage and handling to anywhere in the world. If you are interested in purchasing this exceptional original Kyosai woodblock, please contact me (oz_jim@printsandprinciples.com) and I will send you a PayPal invoice to make the payment easy. 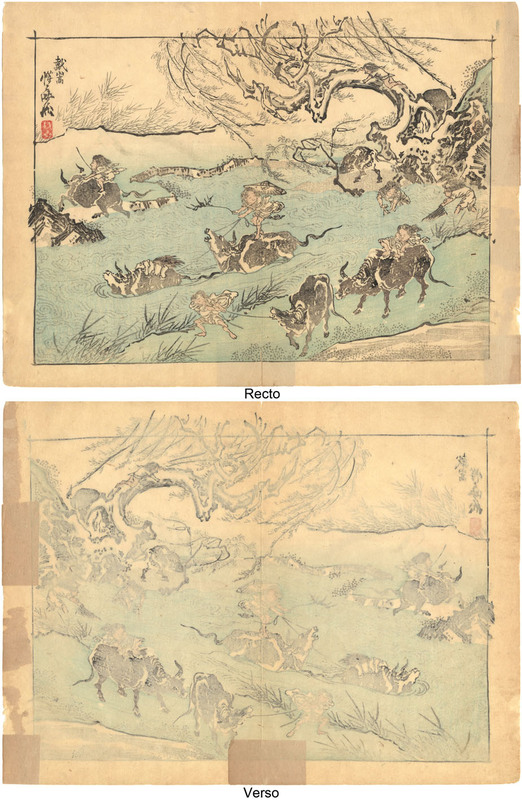 At present the best reference book on Kawanabe Kyōsai is Timothy Clark’s “Demon of Painting: The Art of Kawanabe Kyōsai” (1993) in which he describes this amazing artist as “an individualist and an independent, perhaps the last virtuoso in traditional Japanese painting” (p. 15). Kyosai’s background certainly set him apart from most artists. For instance, his father was a samurai. This alone suggests to me that the discipline of his father's role and social standing may have influenced his son’s lifestyle and mindset. 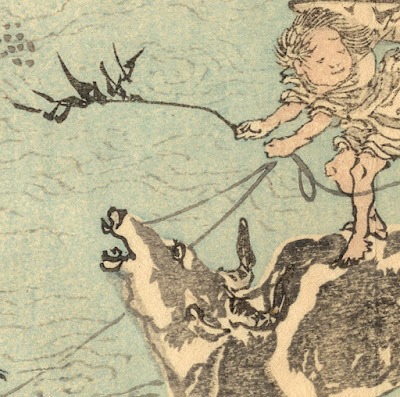 Certainly, his vision of the world at the age of nine seems remarkable—and to my mind, macabrely warped—as he is reported to have picked up a human head from a corpse in the Kanda river (see J. Conder , “Paintings and Studies by Kawanabe Kyōsai”, p. 2). Even his adult life is worthy of a movie as he was arrested and imprisoned no less than three times. Hopefully this brief glimpse into Kawanabe Kyōsai’s background will help to explain the whimsical subject of young men riding buffaloes in unorthodox ways portrayed in this print. 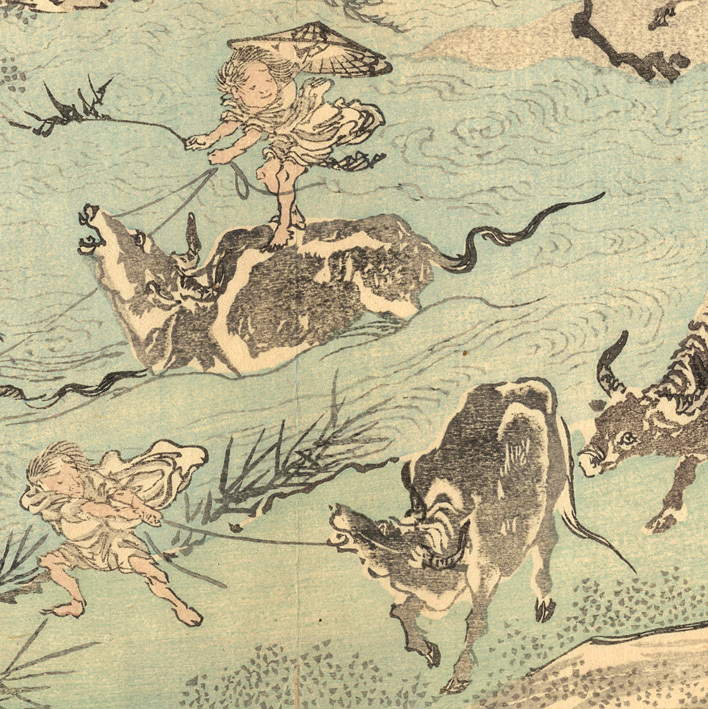 (My apologies to any buffalo riders who guessed correctly that I have no idea how buffaloes should be ridden.) 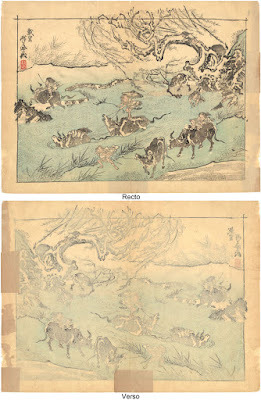 From a personal standpoint, his background does “explain” the compositionally adventurous and visually startling choice to overlap the upper border of the image with the branches of the gnarled tree shown on the right. To my eyes these branches represent more than physical parts of the tree; they represent the artist’s spiritual turmoil and rebellion within. … of course I could be wrong.